As part of a family portrait session I photographed yesterday, we added a little side project. In Galatians 5:22-23, the "fruits of the spirit"- or qualities that are developed as we live life with God- are listed, and at the tail end of the list it says, "against such things, there is no law." Don't you just love that? 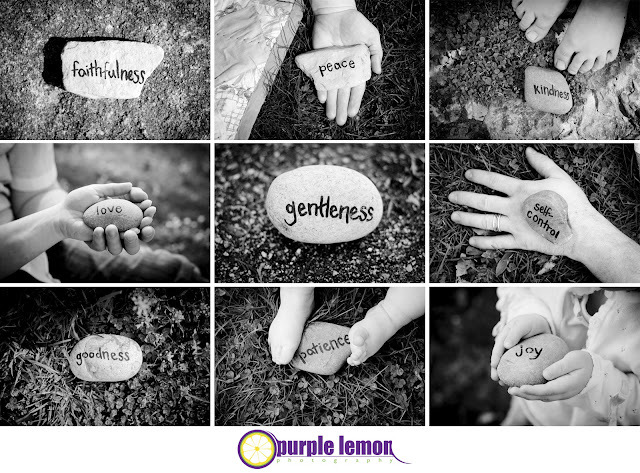 To represent this family's value of these qualities, we incorporated them on these rocks. Each family member was included in this series in some way, and I just love the way this display turned out.